Fact: Hospice care usually takes place in the comfort of an individual’s home, but can be provided in any environment in which a person lives, including a nursing home, assisted living facility, or residential care facility. Fact: Receiving hospice care does not mean giving up hope or that death is imminent. The earlier an individual receives hospice care, the more opportunity there is to stabilize a patient’s medical condition and address other needs. Hospice care focuses on quality of life and making the most of life. Hospice helps patients experience joy, reminiscence, laughter, reunion, and hope. Fact: Studies have shown that hospice care can actually increase patient’s survival for certain diagnoses and when implemented early enough in the disease process. Reasons for increased survival under hospice is due to close monitoring and treatment of symptoms, and an interdisciplinary approach to patient care. Fact: Hospice care is available to patients with a wide variety of conditions, including congestive heart failure, Alzheimer’s disease or dementia, chronic lung disease and more. Fact: The Medicare benefit, and most private insurance, pays for hospice care as long as the patient continues to meet certain requirements. Patients may come on and off hospice care, and re-enroll in hospice care, as needed. Fact: The hospice team (which includes nurses, social workers, home health aides, volunteers, chaplains and bereavement counselors) visits patients on a schedule based upon individual need. The team is available 24 hours a day, 7 days a week to address changing symptoms or urgent needs. Some hospices are able to provide “continuous” or “crisis” care for a limited period of time based on specific crisis level patient needs. Fact: All licensed hospice programs are required to provide certain services, but the range of support services offered differ significantly. Like other medical care providers, business models vary. Some programs are community based, not-for-profit and some hospices are for-profit. Fact: Hospice takes a holistic approach to care, focusing on comfort, dignity, and emotional support for not only the patient, but for caregivers and family. The quality of life for the patient, family members and others who are caregivers is the highest priority. Myth: Patients can only receive hospice care for a six-month period of time. Fact: Hospice care is a right and a benefit. In addition to coverage provided through Medicare and Medicaid, most private insurance plans, HMOs, and other managed care organizations include hospice care as a benefit. In addition, through community contributions, memorial donations, and foundation gifts, Ohio’s Hospice of Dayton is able to provide patients who lack sufficient payment with free services. Other programs charge patients in accordance with their ability to pay. Fact: The role of the physician is to recommend care. The patient has the right to determine when hospice is appropriate and which program suits his or her needs. Before entering a hospice, however, a physician must certify that a patient has been diagnosed with a terminal illness and has a life expectancy of six months or less. Myth: Once a patient elects hospice, the primary care physician can no longer be involved in providing care. Fact: Hospices work closely with the primary physician. Your physician will work in collaboration with Ohio’s Hospice of Dayton to determine if hospice is appropriate. The primary physician continues to be involved in patient care. Fact: Patients always have the right to reinstate traditional curative care at any time, for any reason. If a patient’s condition improves or the disease goes into remission, he or she can be discharged from a hospice and return to aggressive, curative measures, if so desired. If a discharged patient wants to return to hospice care, Medicare, Medicaid, and most private insurance companies and HMOs will allow readmission. 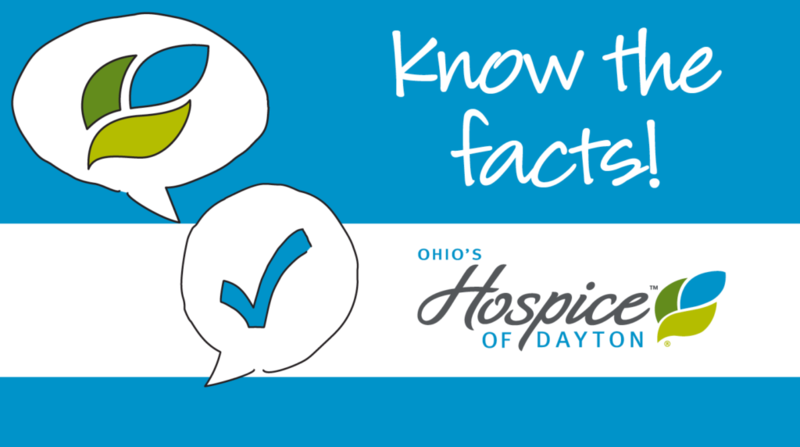 Myth: Hospice facilities are used only for end-of-life care. Fact: Hospice facilities can be used when symptom management is needed above what can be provided in the community setting. Medical management can be delivered in the Hospice facility and once symptoms are under control, the patient can then return to receiving Hospice care at home, in an independent care facility, at an assisted living care setting or at an extended living facility.